At least an hour before making the waffles, whisk egg, cream, oil and sugar together til frothy. Add dry ingredients and whisk well til it is the consistancy of very heavy cream porridge. If it is too dry, add water. If it seems too thin, add cornmeal or flour. Cover the bowl with plastic wrap and let the batter rest in refrigerator. Heat the waffle iron. Flick some water at the pan. If it evaporates immediately, the pan is too hot. If it beads and sits there, the pan is too cool. If it beads and bounces, the pan heat is j u s t right. Ladle a small amount of batter on the iron to make a small first waffle. Cook on one side for 4 minutes. Turn the iron over and cook other side for a further 4 minutes. The finished waffle should lift off easily with the help of a spatula. Put the finished waffle on a serviette covered warm plate. Cover with a lid. For the rest of the waffles, ladle enough batter to cover the iron and cook on one side for 4 minutes. Turn the iron over and cook other side for a further 4 minutes. Continue making waffles until the batter is finished. Serve with butter and honey or maple syrup. If you don't have a waffle iron, add a little more milk to the above recipe to make pancakes on a cast iron griddle (or in a frying pan). These are based on our memory of some wonderful crêpes de blé noir we had on one of our bicycle trips in France. We had just landed (flight Toronto to Lyon) and then ridden our bikes through pouring rain from the airport into Lyon. Who cared that we were drenched from the knee down? Who cared that it wasn't traditional Lyonnaise food? With the pouring rain outside, it looked like Brittany! And crêpes were the perfect thing to make us forget the woes of a long overseas flight. At least 3 hours before making the crepes, whisk egg, milk, oil and sugar together til frothy. Add buckwheat flour and salt and whisk well til it is the consistancy of heavy cream. If it is too dry, add a bit more milk. If it seems too thin, add buckwheat. Melt a little bit of butter and tilt the pan to coat it with butter. Ladle some batter onto the frypan. Tilt the pan back and forth to evenly distribute the batter in a thinnish coating over the pan. Pour any excess back into bowl. Cook for about 3 or 4 minutes per side. Put the finished crêpe on a serviette covered warm plate. Cover with a lid (or not). Continue making crêpes until the batter is finished. (makes about eight 8-inch in diameter crêpes). Wash spinach well. Parboil in boiling salted water for 1 or 2 minutes. Drain and let cool. Put the washed spinach in a colander and sprinkle liberally with salt. Toss to cover the leaves with salt and let sit for about 20 minutes. Squeeze the spinach out well with your hands. Rinse with water and squeeze some more. Set aside. Put a good shot of oil in a large cast iron pan. Sauté onions and mushrooms. When the onions are translucent, add the ham and fry some more. Add all-purpose flour and stir into the oil. Add milk slowly, stirring with a wooden spoon. Keep stirring til smooth and thickened. Just before serving, gently reheat the sauce. Chop the squeezed spinach coarsely and add to the sauce. Stir to warm. Lay 3 crêpes over a plate in a cloverleaf pattern with half of each crêpe hanging over the edge of the plate. Sprinkle some gruyere (or any good Swiss cheese) into the center of the plate. Ladle filling over cheese. Fold the crêpes over the filling, leaving a small hole in the center to allow the ham/spinach filling to show. Serve with sparkling dry apple cider. N.B. 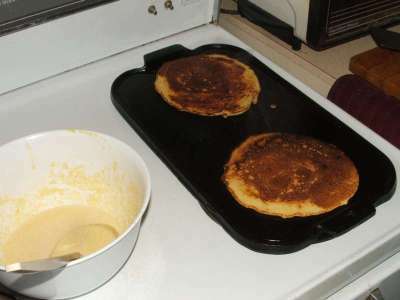 All-purpose can be used in place of buckwheat flour to make regular crepes.